You think you're going to get away with just one board, or you bought your first one thinking, "This should cover me for a few years...". Next thing you know, your buddy, the shaper, shows up at the beach with a shiny new custom board. "Hey just take it for a little spin, catch a couple of waves", he says so nonchalantly, all the while knowing exactly what he's doing; he's setting the hook, sinking the barb. You haven't got a chance. You're preoccupied with owning one of these boards, soon you're running perverse calculations in your head: "If I skip that latte three times a week, and cancel the kid's dance lessons and speaking of the kid, teeth like that build character and being able to focus on things far away is way over rated". Somehow, you find a way to make enough sacrifices to save up enough scratch to grab that next magic ride. Like I said, it's a sickness. So here's my latest contribution to your "problem". 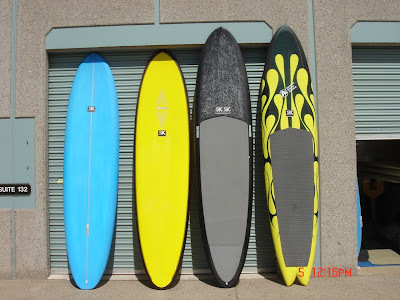 Some new Stu Kenson paddleboards. Check 'em out- I think these are looking really, really good. 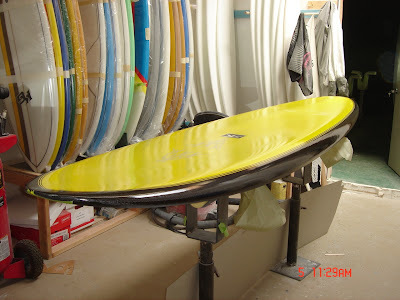 I'm a big fan of the yellow and black 10'6" Stu's shaped out (top picture)- it's 10'6" by 29", just a nice clean shape. I've surfed the larger version of this board in a quad fin and I have to say these fin set ups just have speed built in to them. Sweet boards worth checking out. Want to see one? Come to the WildCoast event on October 7th, I'll have the Alligator on the beach, check it out, give it a spin- after my heat of course. Stand Up heat is at 9am. 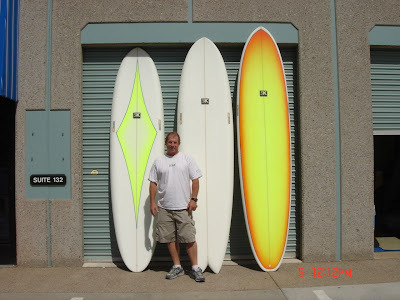 Need Stand Up Gear: Just had a chat with Kelly, owner of Emerald City (619 435-6677 this guy's really got a terminal case of stand-up-itis) seems like they'll be getting in a new shipment of C4 boards any day now- and check out their other paddle specific supplies- Kelly's legit, he surfs stand up everyday, lives it and knows what works, give him a call or come meet him at the Wildcoast Dempsey on Sunday.